Frank Sinatra may have been dreaming of a white Christmas, but with snowflakes swirling furiously outside my window, I’ve been dreaming of Palm Springs. It’s been cold outside for weeks now, and I’d much rather be lounging in the warm sun by a shimmering pool, drinking cocktails, and listening to the voice of Sinatra crooning softly above the rustling palms. 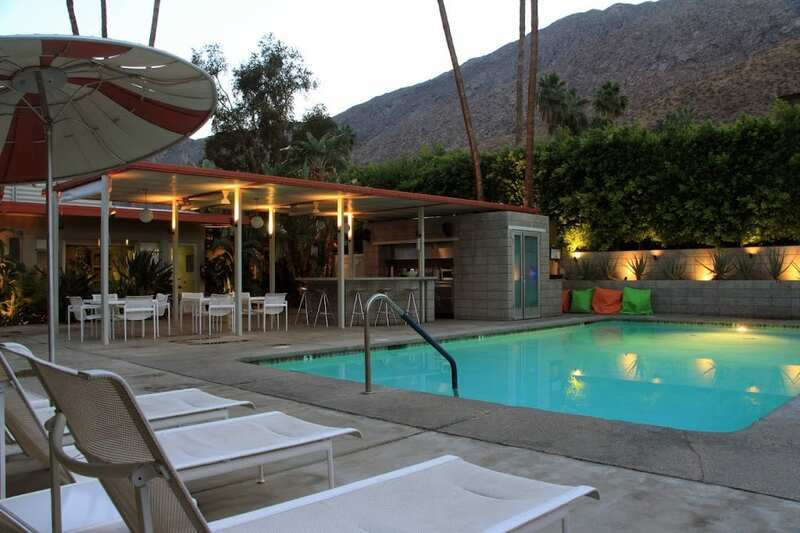 But since I’m currently stuck in the land of snow, I’ll just share five, cool Palm Springs hideaways where you can warm up this winter. Sputnik was launched into orbit the same year modernist architect Herbert Burns designed the Orbit In. 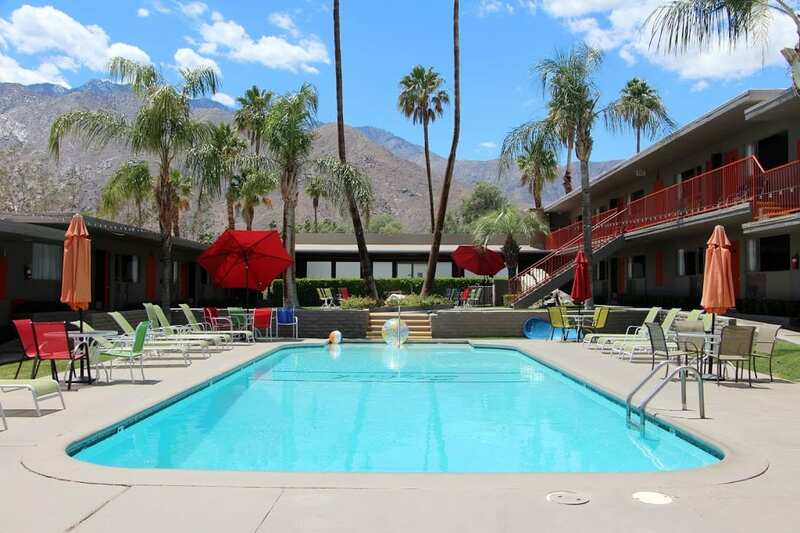 With a time-capsule quality, the ultra-chic boutique hotel transports guests to its swanky mid-century milieu at the base of the San Jacinto Mountains. 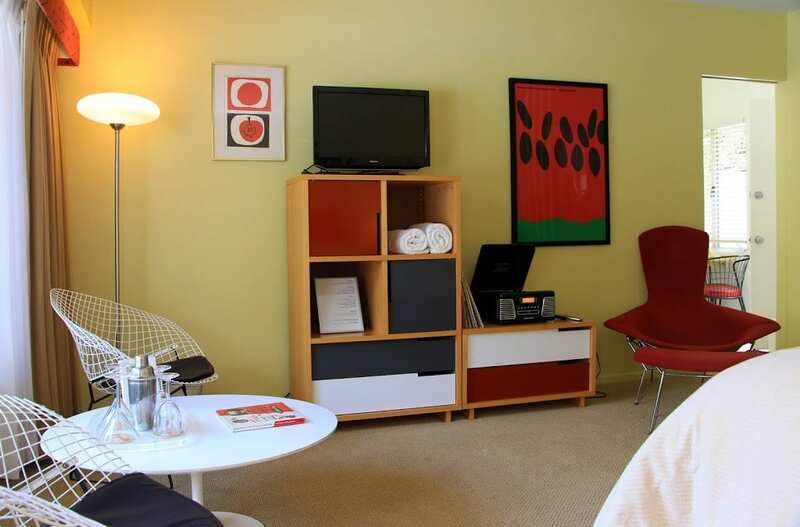 The nine-room inn features the owners’ personal collection of mid-century designer furnishings such as Harry Bertoia chairs, Eero Saarinen tables, and Charles and Ray Eames textiles. Room 108, the Frey Lounge, pays homage to Palm Springs architect Albert Frey. The room’s private rear patio has an outdoor shower and offers great views of Frey House II, which sits on a ridge just above the hotel. 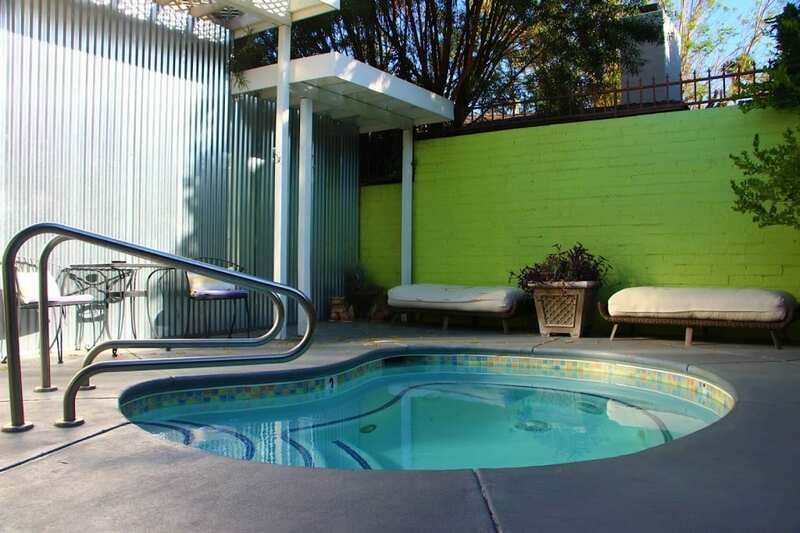 In addition to the designer furnishings and private patios, the rooms also feature original and impeccably-maintained pastel-tiled bathrooms, vintage white steel kitchenettes, floating wall clocks, melamine tableware, and retro record players with a stash of Rat Pack albums. If you’re looking for a particular tune, you can peruse the lobby’s extensive collection of vintage vinyl ranging from big band to bossa nova. 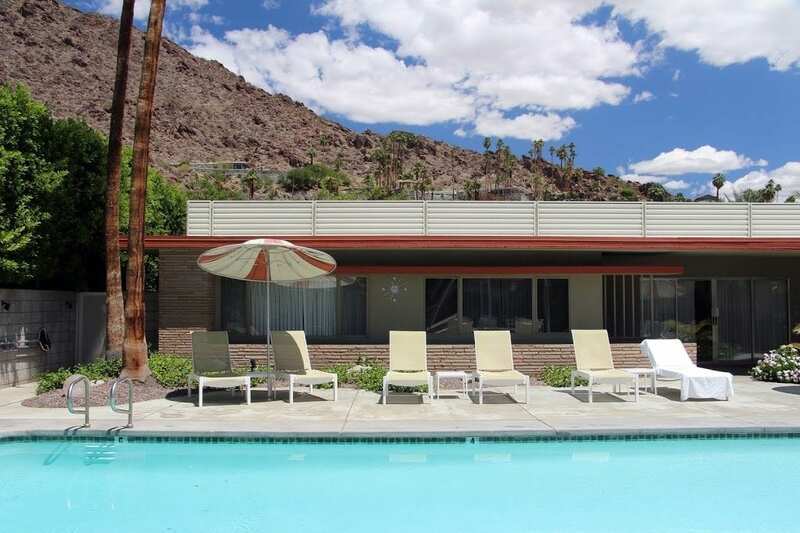 In classic desert modernist style, the rooms are arranged around a private courtyard with a saltwater pool and retro patio umbrellas and lounge chairs. Each evening, owners Kevin Miller and Jinny Park shake things up with their signature “Orbitini” cocktails served poolside around a boomerang-shaped bar. Tucked in a private corner, away from the rooms, you can soak under the stars in a saltwater hot tub next to the glow of a lava rock fire pit. 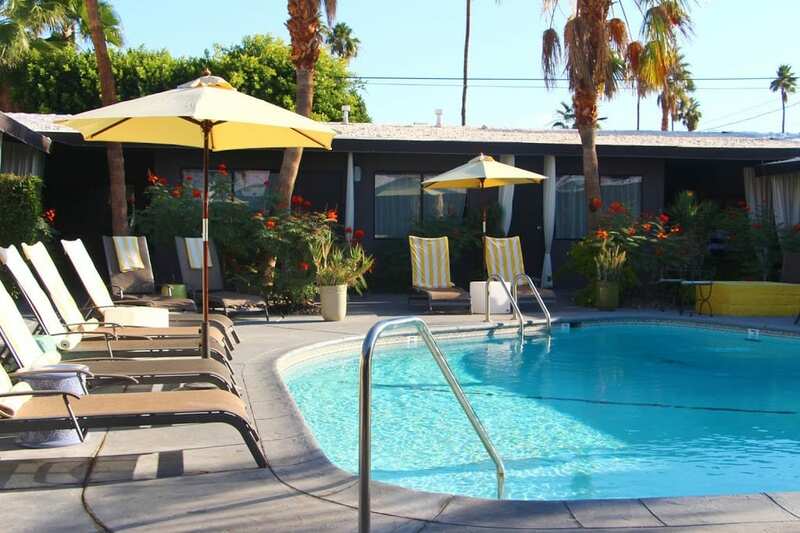 Located in Palm Springs’ historic Tennis Club district, the hotel is a short walk to a multitude of downtown cafes, shops, and galleries. You can also hop on one of the complimentary cruiser bikes for a spin around the neighborhood. Step inside the frosted glass doors of the Avanti Hotel, and you’ll find a stylish, intimate hideaway. Inside the foyer, a white chandelier dangles overhead while soft strains of Sinatra float over the waters of a sparkling pool. 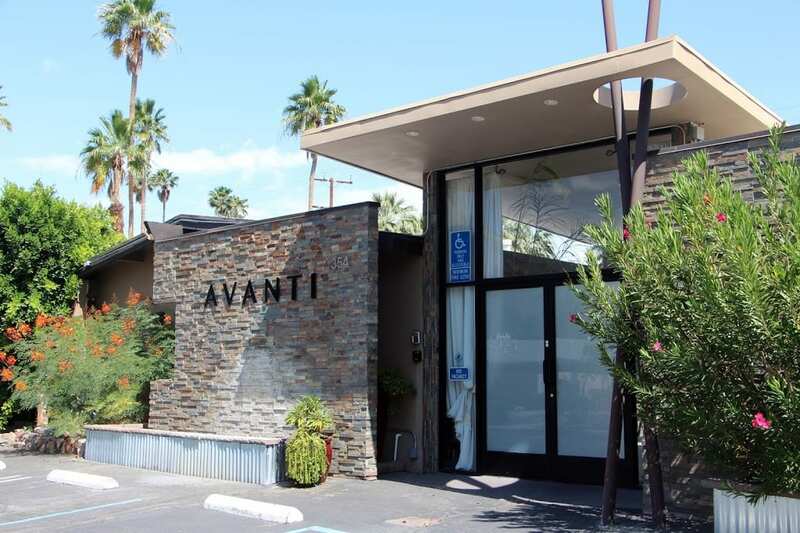 Avanti is located off the main drag in a quiet section of Palm Springs’ historic Movie Colony neighborhood. The hotel features 10 rooms and suites encircling a relaxing central courtyard with a kidney-shaped pool and sublime views of the mountains. The courtyard pool is ringed with lounge chairs, patio umbrellas, a glass rock fire pit, and showy displays of Mexican birds of paradise. 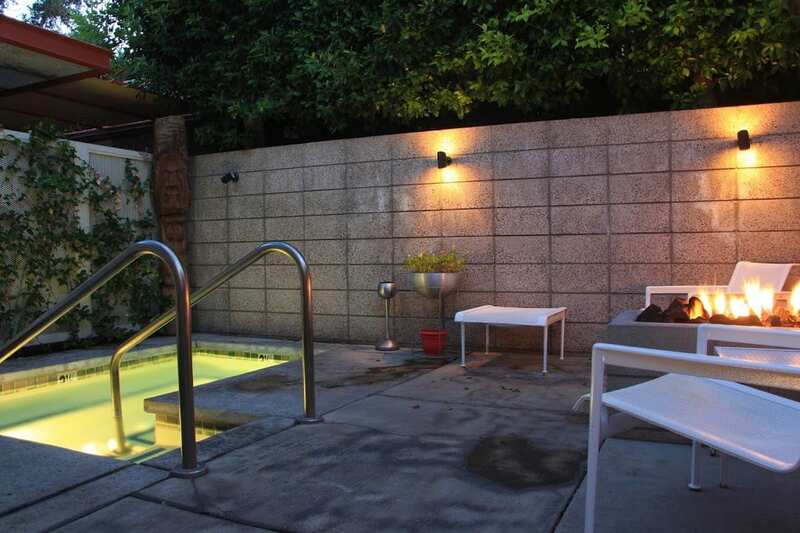 Through a breezeway in the far back corner of the hotel, there’s another, smaller courtyard with intimate outdoor seating and a hot tub for soaking under the stars. The hotel was built in 1954, but has been thoroughly updated. 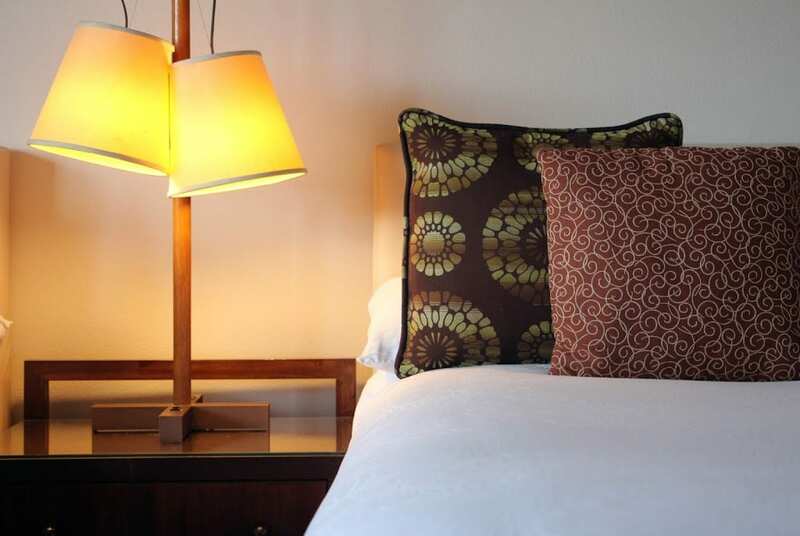 Furnishings include comfortable beds with upholstered headboards, crisp white linens, and modern lamps and side chairs. Room 10 is a hip, cozy studio with a queen platform bed, a zebra print throw pillow, a bright orange full-length mirror, and a private back patio. The contemporary bath features a glass vessel sink and a tiled shower with a rain showerhead. Avanti’s amiable hosts, Jim and Boxley, serve complimentary wine, beer, and mixed drinks poolside each evening from 5-6 p.m. The hotel’s orange and pink retro Huffy bikes are a great way to cruise into downtown for dinner, but if you want to grab carry-out and eat dinner by the pool or on your own private back patio, the hotel offers a picnic basket filled with melamine plates, utensils, and an acrylic wine decanter just for that purpose. 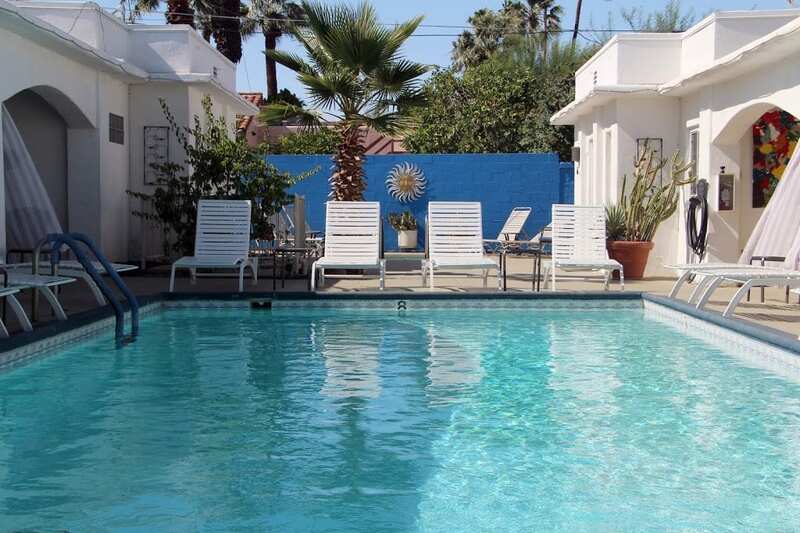 Also located in the historic Movie Colony neighborhood, the equally intimate and tranquil The Westcott Palm Springs (formerly POSH Palm Springs) has a lineage that dates back to Palm Springs’ earliest days as a playground for Hollywood stars. Just one block away from the former El Mirador Hotel–which was Palm Springs’ first resort–The Westcott Palm Springs was built in the 1930s as an overflow hotel for the resort. The boutique hotel features an Art Deco design with arched white colonnades lining either side of the courtyard pool. Pale striped cabana sheers billow in the breeze. Bright blue accent walls and desert succulents lend a Mediterranean flair. The courtyard features views of the mountains, a fire pit, an inviting hot tub at the far end, and offers many more lounge chairs than the hotel will ever have guests. At night, the courtyard is lit with cool blue string lights. In the mornings, the only sounds are the hollow whistle of doves in the trees. 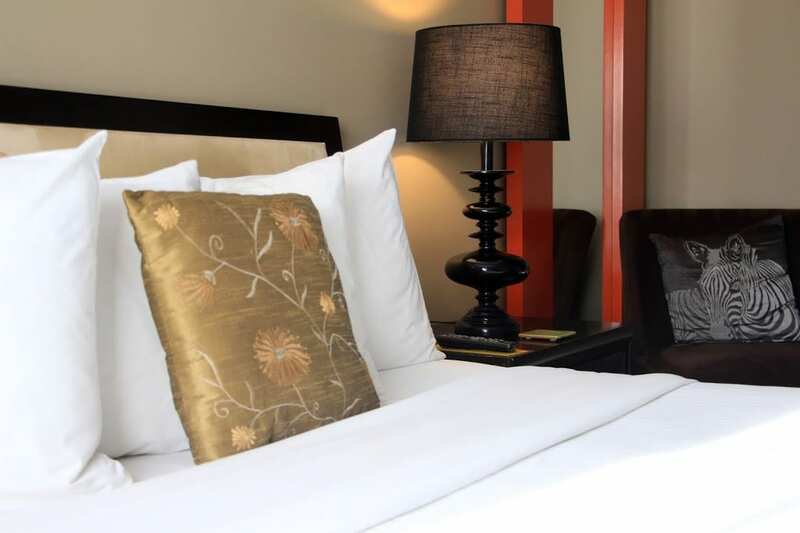 The rooms are impeccably maintained and artfully furnished. 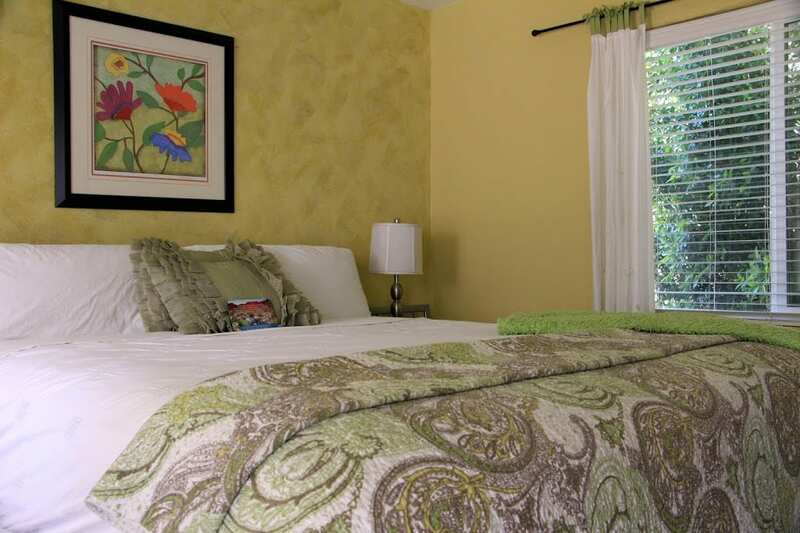 Room #5 is a cheery king room decorated in shades of cream and green with ochre-colored walls. The updated bath features a porcelain sink and a shower with two shower heads. A walk-in closet offers closet organizers and baskets. The closet also holds a refrigerator, coffeemaker, wet bar, and a stash of complimentary jelly beans. For happy hour each evening, the owner serves up complimentary hors d’oeuvres and his signature POSH Martini. 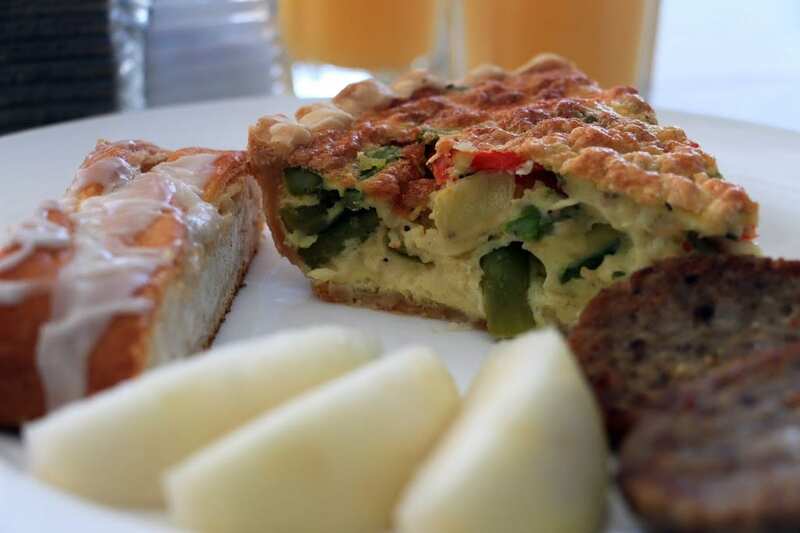 In the mornings, the owner treats his guests to full gourmet breakfasts that are always homemade and always vegetarian. One of his most requested specialties is his Mexican Egg Torta, which is a delicious combination of Southwest flavors baked in a lovely petal-shaped tortilla bowl. 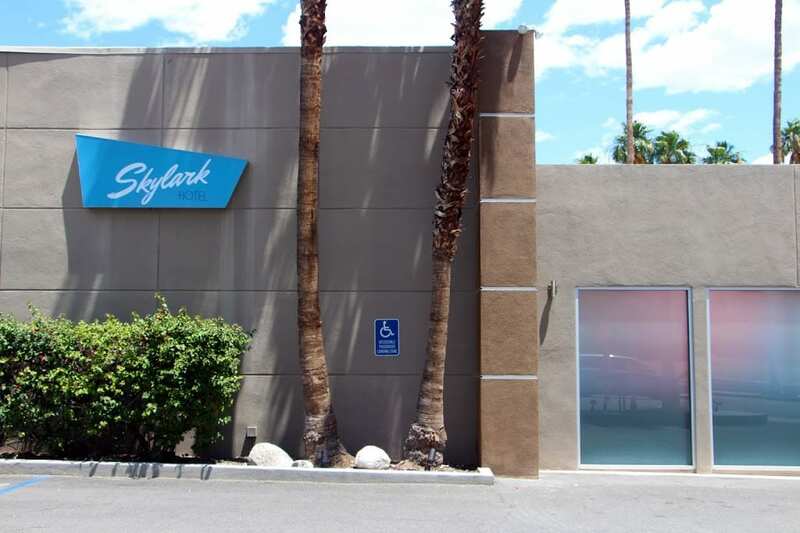 The Skylark Hotel is a fabulously-restored, classic mid-century motor lodge with a young, playful vibe. Beach umbrellas and lounge chairs in vivid technicolors line the hotel’s original 9-foot-deep swimming pool and clover-shaped hot tub. Grab a lounge chair by the pool with a view of the mountains and watch colorful beach balls drift across the water’s surface as big, white, puffy clouds drift across the bright blue skies. The hotel was originally built in 1955 and had fallen into disrepair before it was restored and re-opened in 2013. The 29-room hotel features spacious rooms with modern appeal: Danish teak furniture, crisp white linens, and framed black-and-white photographs of lush forests that serve as a counterpoint to the arid, palm-fringed landscapes outside. All of the rooms have refrigerators, coffeemakers, and 40″ televisions. 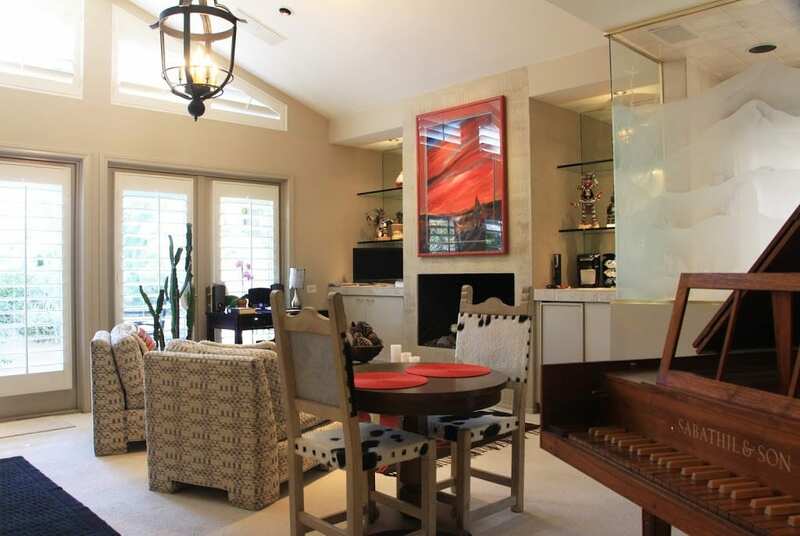 Some rooms also offer wet bars, microwaves, and pull-out couches. In addition to the large courtyard pool and hot tub, the hotel features a grand piano in the lobby, a large tiled sauna tucked into a back corner of the courtyard, and a lounge where a complimentary continental breakfast is served each morning. The lounge also a good spot to enjoy take-out and play an old-school board game. 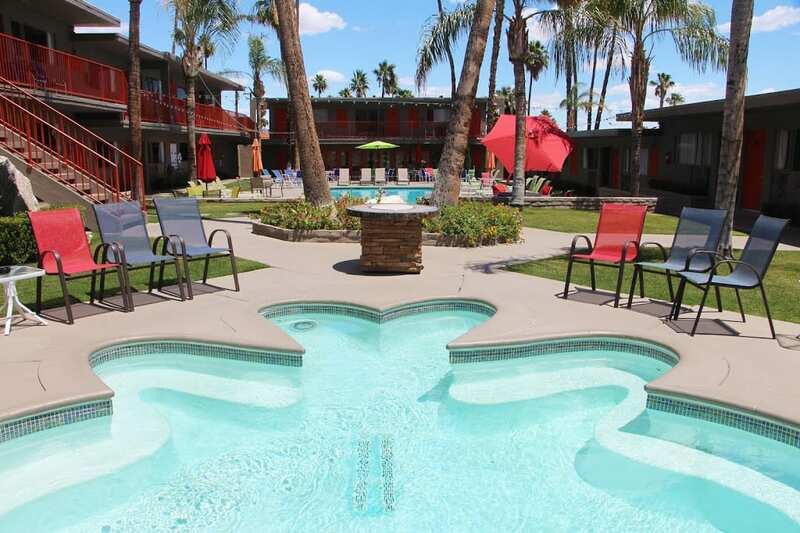 The hotel straddles Palm Springs’ two main streets just north of the uptown design district and affords easy access to downtown. 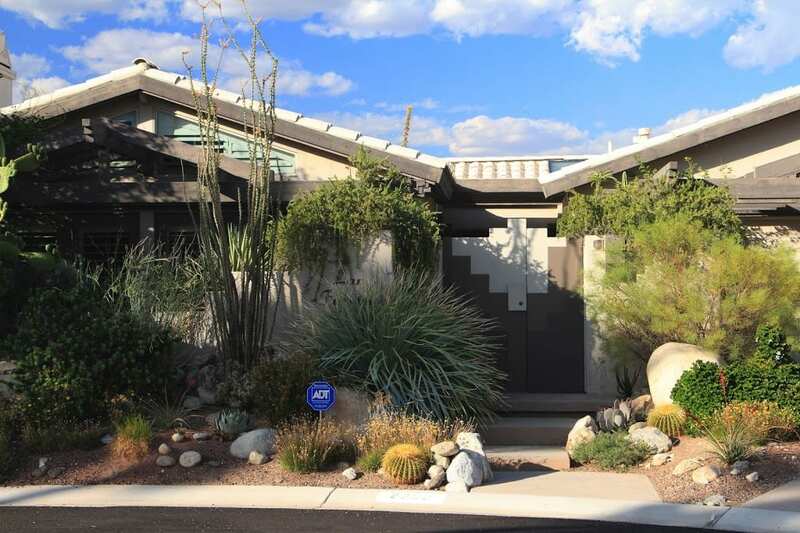 Southwest of downtown Palm Springs, the Araby Cove neighborhood is a quiet enclave of residential homes nestled against a backdrop of scenic mountains. Though it’s less than a 10-minute drive from downtown, it feels as though it’s a world away. 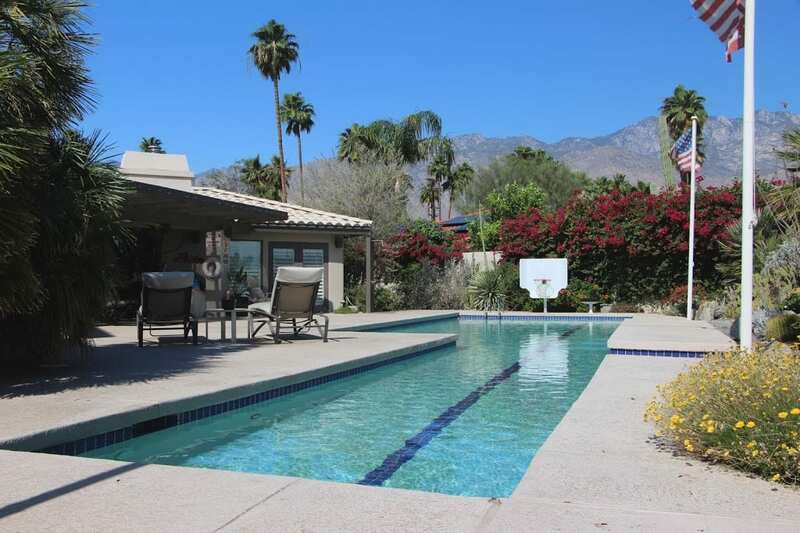 It also affords easy access to several golf courses and the beautiful oasis hiking trails of Indian Canyons inside the Agua Caliente Indian Reservation. For a taste of the good life in Araby Cove, consider a stay at Las Fuentes Inn & Gardens. The inn is a single-suite bed and breakfast housed inside a private home at the end of a cul-de-sac with a private entrance and a long list of amenities. Outside, you’ll find a heated, 60-foot saltwater lap pool surrounded by desert gardens, trickling water fountains, spectacular night lighting, a badminton court, and a shaded patio for lounging. 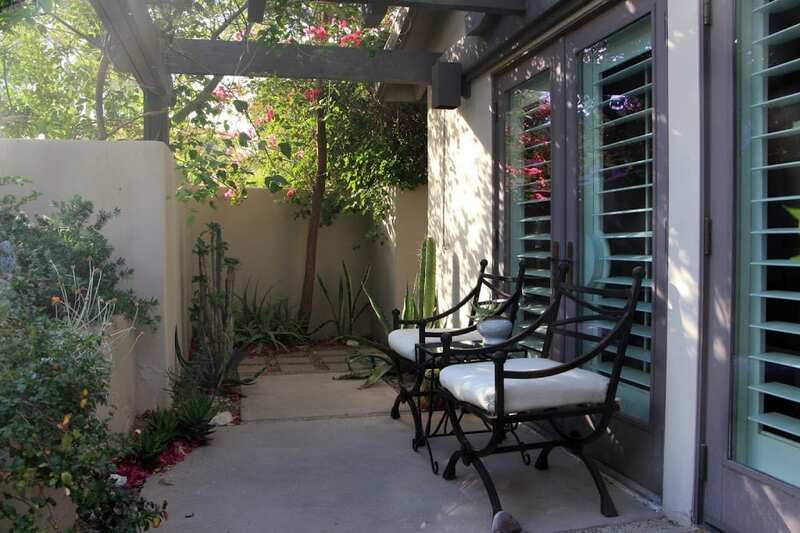 The garden blooms around the pool and the private patio outside the suite’s entrance attract a number of hummingbirds. 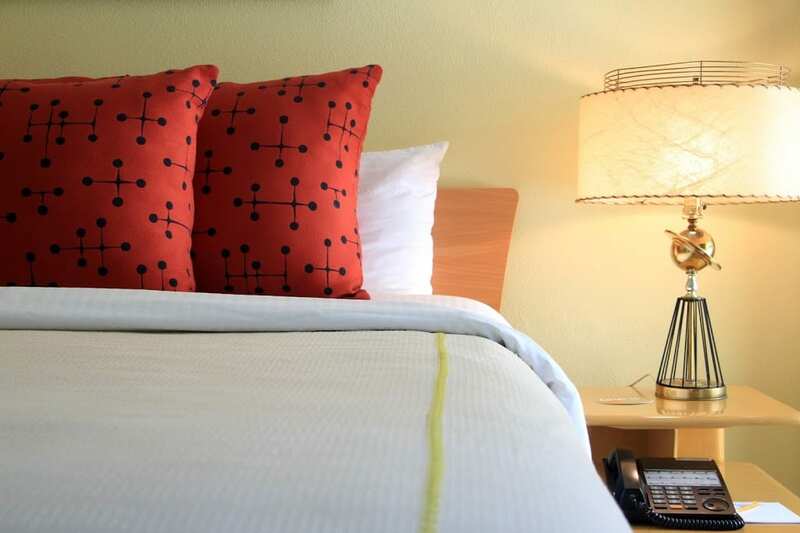 Inside, the suite is furnished in a contemporary Southwest style with modern Native American art. The artwork includes owner Don Karvelis’ collections of black pottery from the San Ildefonso and Santa Clara pueblos in New Mexico, Oaxacan pottery, Navajo baskets, a painted gourd by Robert Rivera, and an original watercolor, “Sunset over Santa Fe” by Evelyne Boren. The suite also features vaulted ceilings, recessed, dimmer-controlled lighting, a gas fireplace, an etched-glass enclosed steam shower with a bench and both rain and hand-held showerheads, a tiled soaking tub, a separate spa tub, an extensive library of books and DVDs, a harpsichord, and more. Each morning, Don prepares a fresh breakfast served in two courses with choices of fruit or yogurt, breads, scones, or muffins, a hot entrée, and beverages. Breakfast can be delivered to the privacy of your suite or enjoyed poolside under the shade of the patio.